Smart carts waiting for instructions. Each automatic guided vehicle unit uses flashing LEDs to direct workers to the correct slots on the two shelves. When a wood shop wants to automate its manufacturing operations, often one or two processes get a high-tech upgrade. Not so Muskoka Cabinet Company of Alfred, Ont., down-river just east of Ottawa. 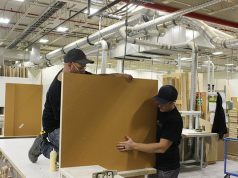 “Every inch of space is planned, equipment racks, shelving and ductwork is designed to be flexible to suit the changing needs of production as we automate,” says president Luke Elias. 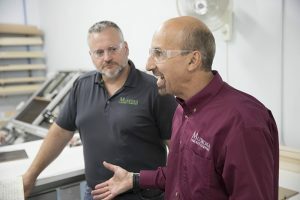 Clearing the path for automation that now includes a custom radio-frequency identification (RFID) system, a “smart” enterprise resource planning (ERP) system and lately, automated guided vehicle (AGV) carts, has been the goal of business graduate Luke Elias since he purchased a 13-year-old company in 1989. His brother Eric joined in 1992 from the banking industry and is senior vice president. The siblings are both from the Ottawa area, and the company also maintains a showroom downtown for sales, and where designers can transmit their software files directly to the shop. Luke leads the manufacturing technology innovation, while Eric oversees sales operations. The latter describes the company selling to as far as Kingston, Ont., to Montreal, Que., and Barrie to Waterloo, Ont. “We’re able to compete with big guys in Toronto,” says Eric Elias. He notes residential construction, condominiums and the rental conversion market are currently fuelling the business. 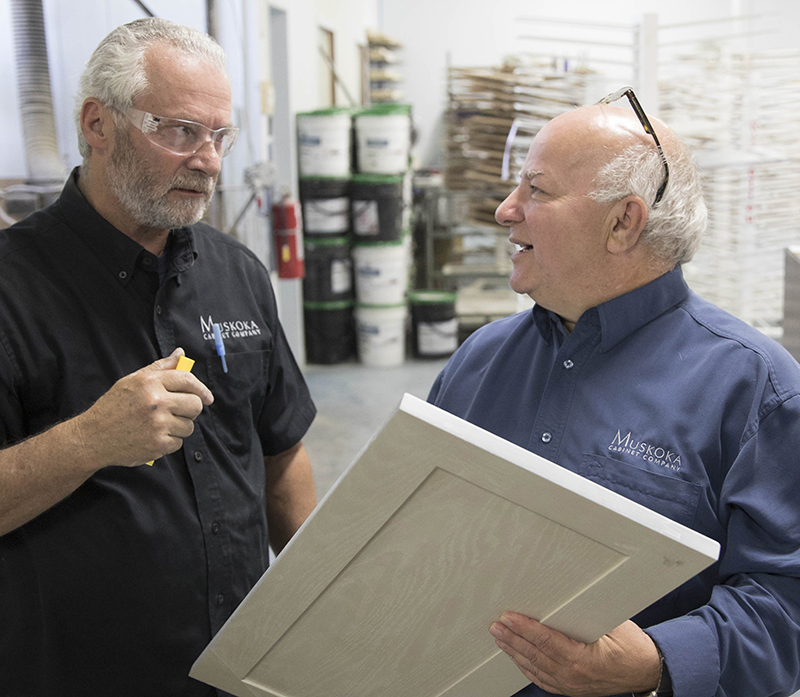 Muskoka Cabinet senior vice president Eric Elias (right) gets a shop floor update. Even property managers and general contractors can take advantage of Muskoka Cabinet’s cloud deployment and review orders on-site with a tablet computer. Luke Elias notes that in the future, with improvements to the Apple mobile operating system, tablets will be able to read the RFID tags embedded in the cabinets. This will allow for the accurate re-ordering of parts and traceability of defects back to the shop floor, he says. The Elias brothers have overseen the transition of Muskoka Cabinet from its commercial origins to servicing the residential market exclusively by 1999. During this time, the company management took note of software then on the market that could help design kitchens and make cutlists. 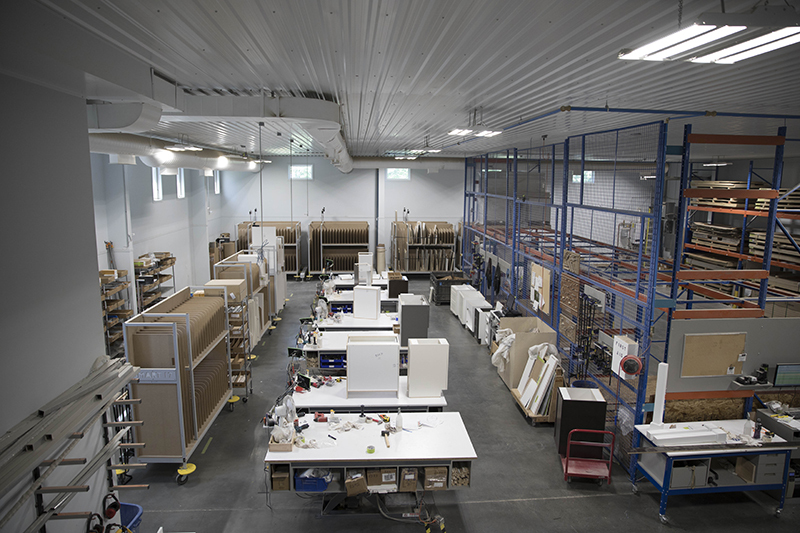 By 2000, the company implemented nested-based manufacturing, a first in Canada, according to Luke Elias. “We also had a computer network setup since 1993, something unusual for the time,” he says. In 2003, Muskoka Cabinet introduced cabinets manufactured from strawboard. The next technology milestone was 2004 when an ERP system was introduced on the shop floor that would communicate between computers installed at each workstation and the front office. This implementation occurred at the company’s new location just up the street from the original one. handling. “Or better yet, the savings realized by reducing the time spent loading, unloading and remaking parts that were damaged as they were pushed around the factory floor,” he says. Before the move, the company spent months planning and streamlining parts flow with the use of conveyors, a parts sorting station and labelling. Production in the new plant doubled in the first month using the same number of people and machines. “I had no idea we were wasting that much time on material handling in our old factory,” he says. Muskoka Cabinet worked closely with Automatech Robotik to develop this CNC work cell. To make this next transition, Muskoka Cabinet called upon the expertise of Automatech Robotik of Saint- Apollinaire, Que., in 2012. “Their robotic assisted nesting cell solution was a natural as it solved many of our goals,” says Luke Elias. 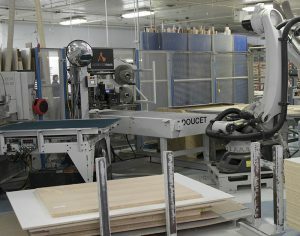 The Automatech robotic work cell was designed to have a three-year payback, but actually clocked in at two years, due to the existing deployment of automation in other areas, such as RFID and smart carts. The Wi-Fi activated carts employ flashing LEDs below slots to indicate where operators should place components from the same cabinet order. This is where the integration of technologies really starts to get interesting, according to Luke Elias. 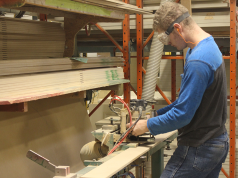 “So far, with no manual intervention we have loaded a sheet on the nesting table, unloaded cut parts from the table, fed selected parts to the horizontal boring and dowel insertion machine, applied RFID surface labels and inserted RFID tags into wood parts that require finishing. We have then created smart parts heading down a conveyor to the edgebanding machine for their first manual operation. Luke Elias, president of Muskoka Cabinet, explains to a tour group how RFID tags are inserted into panels. Production manager Sylvain Gariepy looks on. “Parts are edgebanded as required and the part’s RFID tag is read as it leaves the edgebander’s return conveyor. Reading the tag activates a wireless LED array on a slot in a smart cart, which tells the operator where to place the part in the cart. 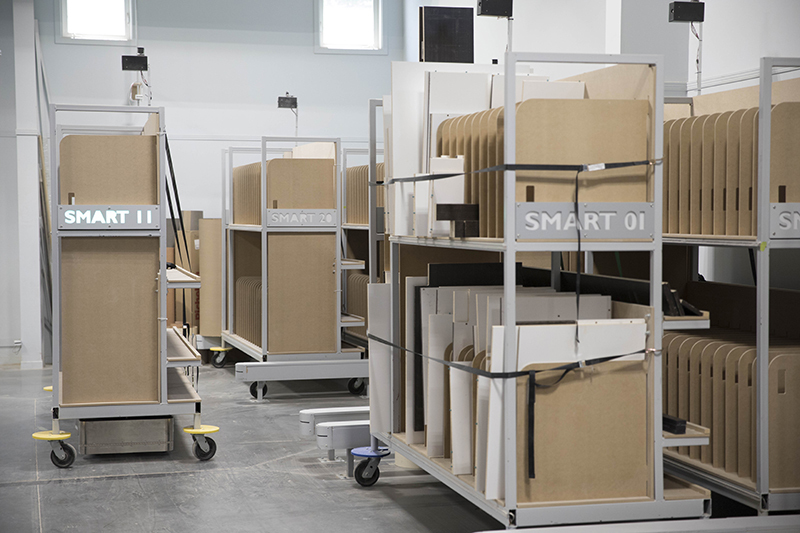 Each slot in the smart cart contains parts for a single cabinet. The current stage of automation rivals anything that could be found at an Amazon warehouse. When the latest AGV-equipped smart cart is full, it is deployed to a parking area until the cart is called upon by the finishing or final assembly departments. Inventor, builder and former medical doctor, Les Buhler, describes the unique AGV requirements as being “able to move 10,000 lb loads in tight spaces — aisles with no room to spare.” Buhler also helped to develop the solution for embedding RFID tags into cabinet component panels so that they can be read at each process location throughout the shop. The solution involves cutting a narrow biscuit on the spine of each panel so a folded RFID tag can safely be inserted. The tag is designed so its RFID antenna is not damaged by this insertion process. Each AGV sports eight Lidar units — the same technology being tested by big automakers in driverless road vehicles — and four infrared (IR) “beacons.” Together, the Lidar and IR scanning technologies ensure the AGV carts can navigate smoothly from workstation to workstation, and from parking lot to parking lot, with a stop at the assembly station along the way. No following rails on the floor. 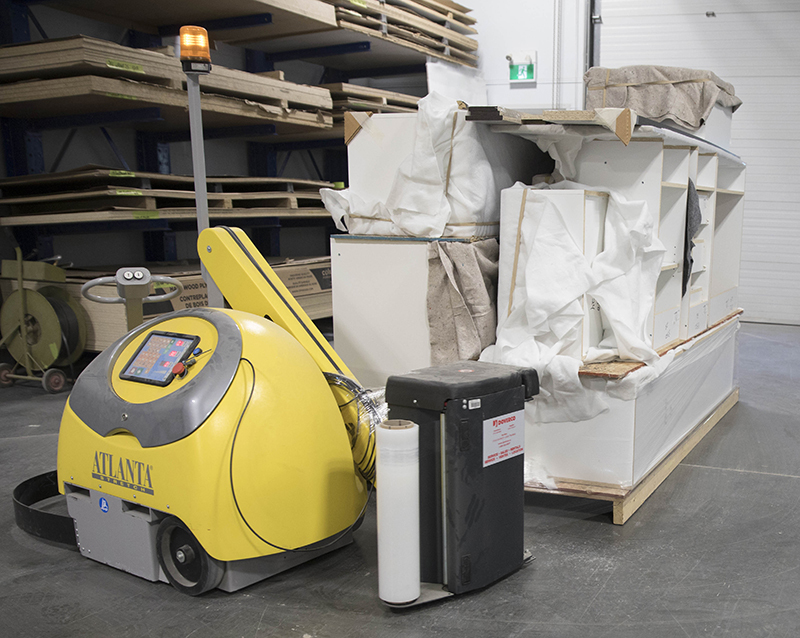 The integration of robotics, RFID, smart carts, AGVs and ERP system facilitates an automatic, part processing, part sorting, part movement, part status, and part costing as each station and process reads each part as it passes through. Assemblers adjacent to the shipping department receive jobs via Windows tablets at each height-adjustable workstation table (to relieve back stress) or can access their jobs by picking a panel off the smart cart for their table’s RFID unit to read. Specialized AGV wraps shipment on loading dock before going onto a truck. Even when product is being palletized at the loading dock, RFID readers are used on the shipping doors and the system automatically applies a shipped status to product as it gets loaded on the truck. 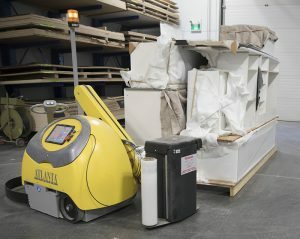 A robot AGV, much like a giant Roomba floor cleaner, wraps the assembled cabinet order with clear plastic by circling the pallet repeatedly until the shipment is safe for transport. Luke Elias notes that Muskoka Cabinet has received and continues to receive substantial support from a National Research Council program (IRAP) for technology R&D and implementation. “We would not be as advanced as we are without their support,” he says. IRAP industrial technology advisor and professional engineer Bernie Schmidt says the NRC has worked with Muskoka Cabinet for five years now — and that it is continuing its relationship. “The story is not finished! “We accelerated their technology adoption and introduced business resources,” says Schmidt, “by developing a robust technology roadmap and an IP (intellectual property) protection strategy.” He noted that after two or three years, IRAP (Industrial Research Assistance Program) was noticing the potential for commercialization of the technological developments at the company. 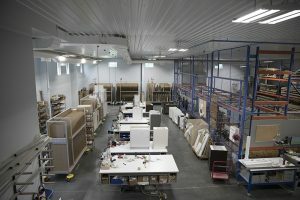 The cabinet assembly department, with smart carts on the left, cart “parking lot” at the top and warehouse shelves on the right. 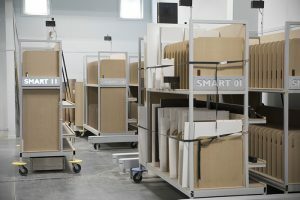 For this reason, smartMRP Inc., Muskoka’s sister company, has partnered with Automatech to implement RFID part and product tracking systems in other shops, and has some projects currently in process that have the potential to fulfil the promise of commercialization seen by Schmidt and IRAP. 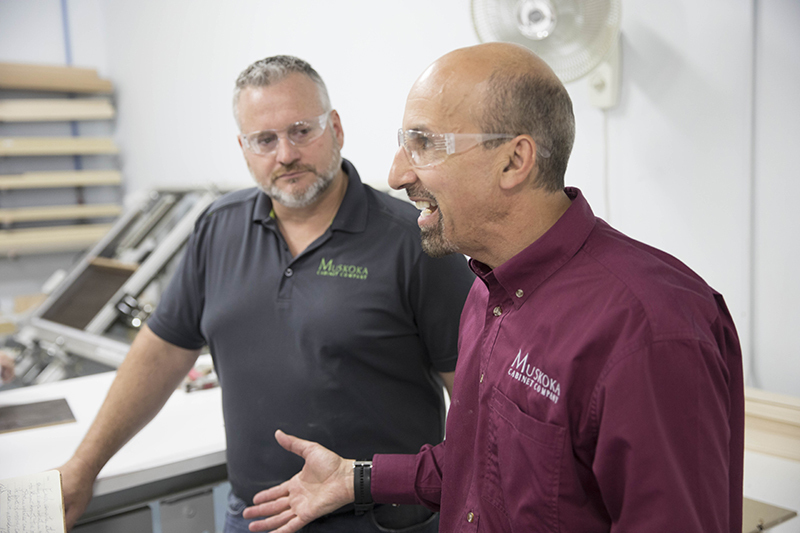 The cabinet manufacturing business can be highly profitable, the Elias brothers believe. In 2015, Muskoka Cabinet had a gross margin that exceeded 40, with a net profit before tax exceeding 20 percent. On $10 million in sales, for example, that would translate into a $2 million net profit, the company explains. The total number of employees varies from 55 to 60, including the designer showroom, with 25 required for the shop floor. Today he continues to look for better ways to make products, including acquiring new equipment and justifying its payback. Working leaner, fixing machines and reducing downtime all play their part, according to Gariepy. Closeup of the RFID insertion slot on the side of a panel. 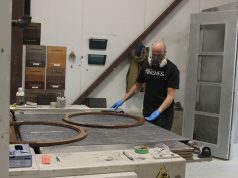 Making the technology transition to 100 percent water-based finishes was a gruelling process taking several years, however. The company’s finishing line commissioning process was a disaster, admits Eric Elias. “We threw $100,000 worth of materials at it, even though it was tested before being installed in our shop,” he says. Muskoka Cabinet is a manufacturer and distributor of Breathe Easy Cabinetry. 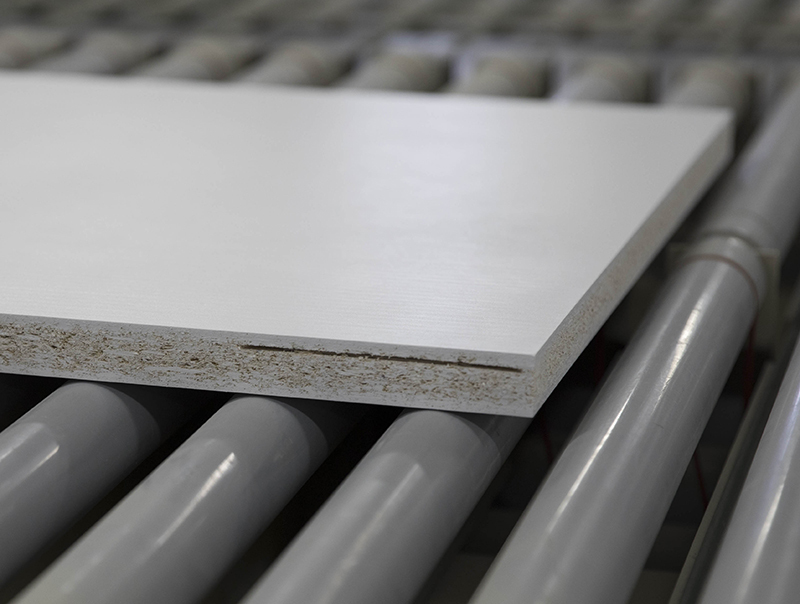 The cabinets are constructed of non-toxic, environmentally friendly products such as responsibly harvested solid wood, formaldehyde-free cabinets, and non-toxic water-based glues and finishes. In all, a designers’, producers’, marketers’ and consumers’ dream.